Bistro Romano Italian restaurant in Society Hill. Online reservation site and app OpenTable has released a new list of eateries that highlights local businesses. Out just in time for Valentine's Day, the "100 Most Romantic Restaurants in America for 2016" list includes six spots in the area. 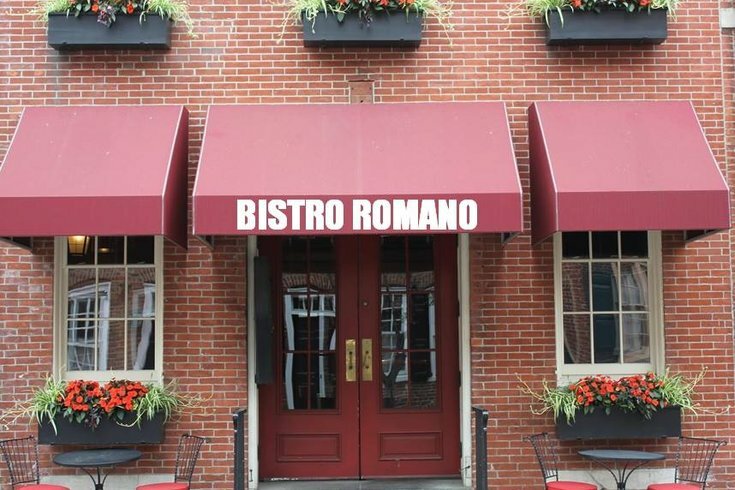 Bistro Romano, an Italian restaurant in Society Hill, was the only Philadelphia eatery to make the list. However, The Farmhouse at Turkey Hill in Bloomsburg, a continental restaurant, and American establishments The Inn at Barley Sheaf Farm in Holicong and The Duling Kurtz House in Exton were also featured. As for New Jersey, Cape May's Peter Shields Inn and Cafe Matisse in Rutherford both made the list as well. The list doesn't reveal why each restaurant was chosen besides that they were selected from more than 5 million reviews of more than 20,000 restaurants. The introduction also says those that made the list feature "scrumptious food, [an] alluring ambience, and bespoke service." Featured restaurants link to their respective OpenTable pages.